When you add your music albums into Musicnizer, the program creates a page for the corresponding artist. On this page, you can see all albums of the artist that you have in your collection. Furthermore, additional details of the artist can be downloaded from the internet, including a biography / history, photos, discography, etc. Musicnizer sorts discographies by year, showing the most recent albums at the top of the list. However, there are some additional sorting options. Click "OK" to apply your changes and close the window. By title ascending (A -> Z). By title descending (Z -> A). Your preferred sorting method is saved, and Musicnizer will apply it to all discographies. There are always 3 sorting icons. The 4th one, for the currently selected method, is hidden. Musicnizer allows sorting discographies in other ways, too. Just check the available options on the "Collection" tab. 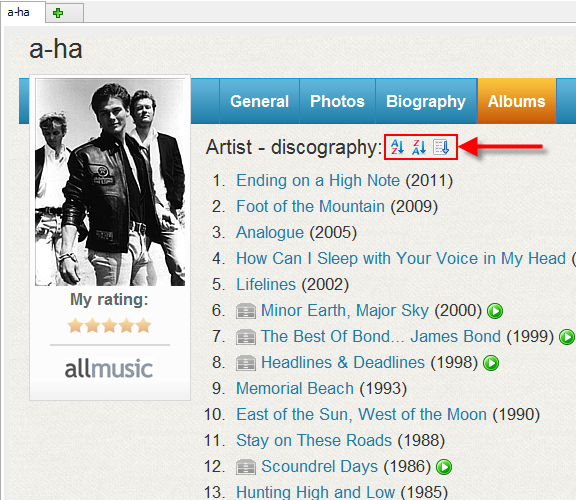 Additionally, you can enter an artist's name into the "Quick search" field while browsing the "Albums" tab and use the "Manage" - "Sort album list by" menu.